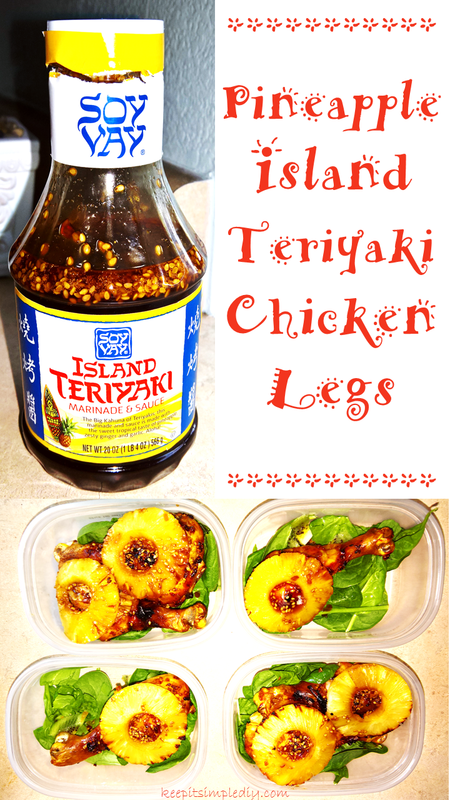 We have recently fallen in love with these island teriyaki chicken legs. They are super simple and taste great! I start by thawing the chicken legs. Once they are thawed, I put them on a greased tray and then bake in the oven at 400 degrees Fahrenheit for about an hour to an hour and a half depending on the size of the legs. Once the legs are almost completely cooked, I pull them out and cover them with the Soy Vay Marinade & Sauce, Island Teriyaki , add a few pineapple rings, and put them back in the oven to bake for another 15 minutes or so. In the last couple minutes, I add a bit more sauce to the legs. The chicken legs are great with spinach although since I used the legs for lunches at work, I had to reheat them which caused the spinach to cook. Next time I’ll keep the spinach separate. Do you have a favorite sauce for your chicken? Yummy! I love pineapple island anything!! Yummy in my tummy this sounds so good! I love anything with pineapple! Mmmm! That looks delicious. It is getting close to dinner time and I want to just reach through the screen and grab one! These look simple and yummy…perfect weeknight dinner! Teriyaki and pineapple: Yum!!! can’t wait to try! Oh this looks so good! Definitely pinning this for later use. One of my favorite recipes so yummy. Love Soy Vay! Pineapple and teriyaki is always a winner, but I also have another staple chicken sauce which is a balsamic, soy and brown sugar glaze. Kind of a similar vibe to this recipe with the sticky sweet taste. Oh yum, this looks super tasty!